The universe which surrounds us is created of many items which we can be touched and those drawn or shown on a flat surface. In considering shapes, man sometimes describes shapes in respect to the number of dimensions they display. There are two main categories used to describe the dimensions of objects. They are: two-dimensional and three-dimensional. Two dimensional shapes are flat figures. Most drawings of shapes on papers fall into the two dimensional realm. These types of shapes take up space or area, but they do not seem to have a thickness or have volume. Most representations which mankind makes of objects such as blueprints, drawings, pictures, etc… are two-dimensional representations. The surface upon which they are represented is flat. Touching the representation provides no depth, thickness or volume. Length and width can generally be calculated by examining the representation or are included as frames of reference. For example, when building a house an architect may provide a two-dimensional drawing to the perspective home owner so they have a better understanding of what the finished product will look like. However, no architect draws the house in real dimensions, a scale is included to help the home owner better understand how large the final product will be upon completion. In contrast to two-dimensional shapes, there are three-dimensional shapes. Shapes which have length, width and thickness are known as three-dimensional shapes. Examples of common three-dimensional shapes include: boxes, cans, balls, buckets, beds, etc... Returning to the example of a house and the architect from above, the architect might construct a three-dimensional miniature model of the house to further clarify specific details for the homeowner. Sometimes it is difficult for people to look at a two-dimensional drawing and imagine what the final three-dimensional product will resemble. It is in this case where models are most helpful. Following are pictorial representations and labels for many common three-dimensional shapes. The surfaces which surround a three-dimensional shape are often referred to as a geometric solid. Although, one might interpret from the term solid, the term itself does not in anyway refer to the inside of the three-dimensional shape. In other words, a geometric sold can be hollow. In this case, the term solid refers more to the fact that the shape displays all three dimensions. It takes up space, has length, width and height. In addition, geometric solids display volume of some sort. By displaying volume, it is meant that if hollowed out, the geometric solid could be filled with liquid. Due to the size, material and scope of some of the geometric solids, this is not always possible and requires a more theoretical understanding than actual implementation. Additionally, the geometric solid can be flat (face), or curved. Where line segments or curves meet on a geometric solid, there are edges. It might be helpful to think of the edge of a table or desk to help you remember this terminology. The corners of the geometric solid are known as the vertices (vertex). Remember that in tessellations the vertex point is where the corners come together. Making these types of connections with the vocabulary terms not only helps to better understand the concepts in a geometric sense, but provides a more in-depth understanding of the world around us. The apex is the term which describes when a vertex is opposite of a circular base. A circular face is referred to as a base. Polyhedrons are geometric solids which are covered on all surfaces by polygons. 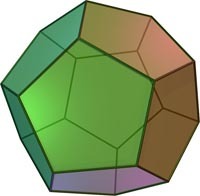 The term polyhedron comes from the Greek derivative of poly, meaning many and hedron meaning face. Thus, a direct translation would be a three dimensional shape with many faces. There are numerous examples of polyhedrons. Cubes, such as a die, are one of the many examples of polyhedrons. In a cube, each face is created of a square. It is the combination of putting the many squares together on the faces which lead to the object becoming three dimensional. Polyhedrons are also made up of edges and vertices. The vertices in this case are where three or more of the faces come together at one point. While the edges on a polyhedron are the line segments where two of the faces meet. A soccer ball is considered a truncated icosahedron. The faces of the soccer ball are created by combining hexagons and pentagons. 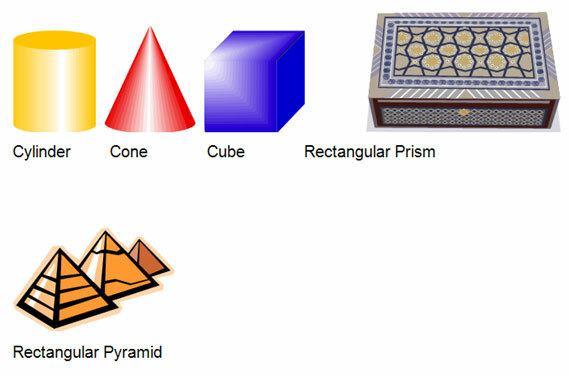 Prisms and pyramids are examples of polyhedrons. Pyramids and prisms are often described by what shape makes up the base. For example, a rectangular pyramid has a rectangle for a base, while a triangular pyramid has a triangle for a base. Both are considered in under the broader term of pyramid, however, the use of the descriptor (rectangular or triangular) provides further understanding of exactly what the shape may look like. Prisms are constructed of congruent polygons on the top and bottom, while all of the other faces are formed by rectangles. The rectangular faces are known as lateral faces while the top and bottom are referred to as bases. In the case of a rectangular prism, the faces are all rectangles, just as the cube had square faces. A rectangular prism has six faces, eight vertices and twelve edges. A refrigerator would be a real-life example of a rectangular prism. Pyramids are polyhedrons where the base is a polygon and all of the other faces are triangles. In many pyramids, the lateral faces are also congruent. Congruent shapes are those which are the same size and shape. The vertex in a pyramid is where the lateral faces meet. It is also referred to as the apex. 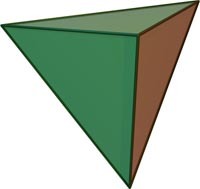 A triangular pyramid has a triangle for a base and three other triangular sides. It therefore has four faces, four vertices and six edges. 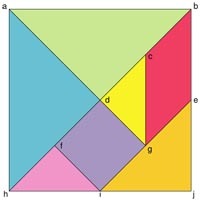 A rectangular pyramid has a rectangle as the base with the other four faces being triangles. A rectangular pyramid has five faces, five vertices and eight edges. The more detailed one can be when describing two- and three- dimensional shapes, the more accurate they will be represented or understood by others. The number of faces, edges and vertices on a prism or pyramid changes with the number of sides on the base. Through recent technologies many typically three-dimensional shapes can be represented through two-dimensional means. Computers have made this a common experience through the many software options. Computer programs, such as drafting or design programs provide the ability to input the dimensions of an object. They then take these dimensions and display a representation of the three-dimensional object on a two-dimensional computer monitor. This process has helped with the visualization of complex ideas as well as a better understanding of three dimensional shapes.